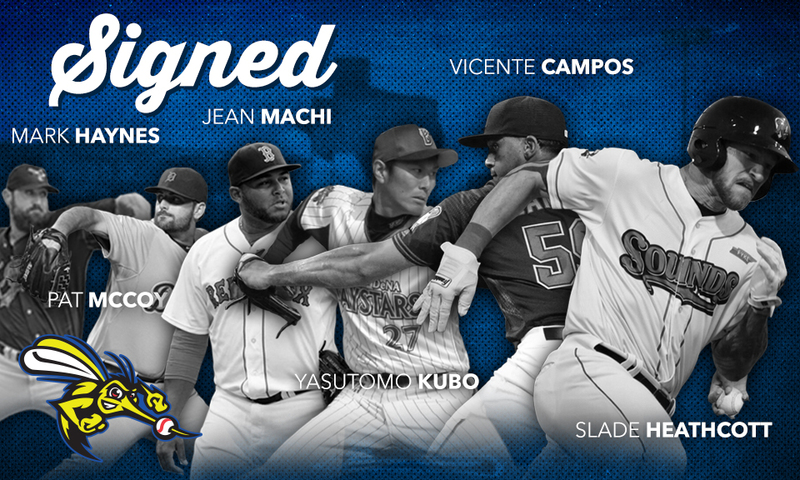 SUGAR LAND, TX— The Sugar Land Skeeters today announced they’ve acquired the following players: RHP Vicente Campos, RHP Mark Haynes, OF Slade Heathcott, RHP Yasutomo Kubo, RHP Jean Machi and LHP Pat McCoy. Campos, Haynes, Heathcott and Kubo were all activated prior to Friday’s game against the Road Warriors, Machi was activated prior to Sunday’s game and McCoy was activated prior to Monday’s game. The team also announced that right-hander Ben Rowen declared his retirement following nine professional seasons. Kubo, 37, made his American professional baseball debut in 2018 with the Gary SouthShore RailCats of the American Association, following 13 seasons in Nippon Professional Baseball. He’s set to make his Skeeters debut on Monday against the Road Warriors, with first pitch at 7:05 p.m. The Skeeters acquired Kubo from the RailCats in exchange for future considerations. Kubo’s stops in Japan included time with the Chiba Lotte Marines (2005-08), Hanshin Tigers (2009-13) and Yokohama Bay Stars (2014-17). He won the Pacific League Rookie of the Year in 2005 while pitching for the Marines and went 97-86 with a 3.70 ERA and six saves in 304 career appearances (231 starts) in Nippon Professional Baseball, spanning 1,540 innings pitched. In three outings with the RailCats (two starts), Kubo has gone 0-0 with a 4.05 ERA. Machi, 36, began the 2018 campaign with the Diablos Rojos del Mexico of the Mexican League, going 5-3 with a 5.20 ERA in 28 relief appearances. A veteran of five Major League seasons, Machi last appeared in the Majors in 2017 with the Seattle Mariners. He made his Major League debut in 2012 with the San Francisco Giants and made appearances at the Major League level with the Giants from 2012-15 and was a member of the team’s postseason roster during its 2014 World Series title run. The El Tigre, Venezuela, native also appeared at the Major League level with the Boston Red Sox in 2015. Through five Major League seasons, Machi has gone 13-2 with a 3.38 ERA and six saves over 194 games, spanning 191 2/3 innings pitched. Heathcott, 27, was selected by the New York Yankees in the first round (29th overall) of the 2009 MLB Draft out of Texas High School (Texarkana, Texas). Prior to the 2013 season, he was ranked as the No. 63 prospect in baseball, per Baseball America. He made his Major League debut in 2015 with the Yankees, which has accounted for all of his Major League service time, and hit .400 with two home runs and eight RBIs in 17 games. He began the 2018 season with Triple-A Nashville (OAK) and hit .266 with a home run and nine RBIs in 30 games. Along with the Athletics and Yankees, he’s spent time at the Minor League level with the Chicago White Sox (2016) and San Francisco Giants (2017). Campos, 25, has spent the 2018 season at the Double-A and Triple-A levels within the Los Angeles Angels Minor League system, going a combined 1-3 with a 7.04 ERA in 12 games (one start). He made his Major League debut with the Arizona Diamondbacks on August 27, 2016, allowing three runs (two earned) and striking out four over a 5 2/3-inning relief appearance. The native of La Guairá, Venezuela, is a cousin of Atlanta Braves outfielder Ronald Acuna and Kansas City Royals shortstop Alcides Escobar, along with former Major Leaguers Kelvim Escobar and Edwin Escobar. He’s also the nephew of former Major League infielder Jose Escobar. Campos was originally signed by the Seattle Mariners in 2009 as an amateur free agent from Venezuela. Along with the Angels, Diamondbacks and Mariners, he’s spent time at the Minor League level with the New York Yankees. He’s 35-31 with a 4.00 ERA in 132 career Minor League appearances (102 starts), spanning 526 innings pitched. McCoy, 29, began the 2018 season with the York Revolution and went 1-4 with a 4.54 ERA in seven games (six starts). The 29-year-old made his Major League debut in 2014 with the Detroit Tigers and went 0-0 with a 3.86 ERA in 14 appearances (14 IP), which has accounted for all of his Major League service time. McCoy last appeared at the affiliated level in 2016 with Triple-A Buffalo (TOR) and has spent time at the Minor League level with the Washington Nationals (2007-13), Detroit Tigers (2014), Baltimore Orioles (2015), Colorado Rockies (2016) and Toronto Blue Jays (2016). The Tuscon, Ariz., native was selected by the Nationals in the 10th round of the 2007 MLB Draft out of Sahuaro High School (Tuscon, Ariz.). Haynes, 31, has pitched with the Skeeters in each of the last two seasons and has spent the 2018 campaign with the Wichita Wignuts of the American Association, going 0-0 with an 18.00 ERA in six appearances (5 IP). In 2017 with the Skeeters, Haynes went 2-5 with a 3.40 ERA in 55 appearances and owned a 3.38 ERA in three appearances with the 2016 Skeeters, who went on to win the Atlantic League Championship. Haynes pitched with the Laredo Lemurs of the American Association from 2012-15, playing under current Skeeters manager Pete Incaviglia. Haynes has also made stops at the Independent level with Shreveport-Bossier Captains, Amarillo ThunderHeads and Kansas City T-Bones of the American Association, making his professional debut in 2010. In 267 career appearances (19 starts) at the Independent level, Haynes has gone 17-21 with a 4.70 ERA and 43 saves through 371 1/3 innings pitched.